Enter to Win the "American Hustle" Flowers and Garbage, Diorella Perfume Giveaway! Mayor Carmine Polito: What am I smelling? It smells like flowers! Rosalyn: Flowers, but with garbage! Mayor Carmine Polito: You know what that is for me? It’s coriander for me…it’s coriander. Ever since David O. Russell's "American Hustle" came out, people far and wide have been talking about the perfume scene in which Jennifer Lawrence's character Rosalyn gushes about the bewitching smell of a fingernail polish from Switzerland. 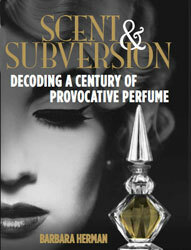 (Perfume-lovers on Basenotes, Badger & Blade and Perfume Posse talked about it, too). Hell, I even wrote about the scene, saying it sure did sound familiar. *Gorgeous fragrances often contain notes of something nasty. Carmine Polito smells Rosalyn's nails and says, "You know what that is for me? It’s coriander for me…it’s coriander." Uncanny, right? Film critic Stephen Metcalf at Slate had an interesting question about this scene in a recent podcast. "Like, why does the mayor of Camden NJ have a set of associations with the smell coriander?" he asks. It is a reasonable question. Seriously — why does he? (And since when do people sniff fingernail polish? But I digress.) Metcalf has an intriguing theory: "I'm not saying he couldn't, that in 1979, that this couldn't be a possible smell he picks up out of the top notes of her fingernails. But that certainly is a complete improv moment." Metcalf concludes that Jeremy Renner must have improvised the coriander reference. Hey, it's as good a guess as any. Or, perhaps the dialogue was copied from elsewhere. Like, you know, my Diorella post. In any case, you folks out there who don't hoard vintage perfume must be dying to know what something "sweet and rotten, sour and delicious...like flowers but with garbage" might smell like. And here's your chance. Tell me in the comments section below if this scene in "American Hustle" intrigued you, and why or why not, and you'll be entered into a draw to win ONE of THREE 1 ml. decants of VINTAGE DIORELLA perfume that I'm giving away from my personal stash. Christian Dior sells a reformulated Diorella at their counters, and it is lovely, but if you want that funk that Rosalyn and I are talking about, you gotta smell the vintage. I'll announce the lucky winners on Oscar night — Sunday, March 2! And please note, U.S. contestants only. If you're commenting from outside the U.S., please let me know that you're commenting only. Thanks for playing! Yep, that's the scene that got me to the movie. I have a mini of the old formulation, so in the interest of luring new sniffers to old scents, don't include me in the drawing. I haven't seen the film. My husband went to see it without me when he took a day off from work. So I wil wait until its on Netflix now. Of course the reason I'd like to see it is just for this scene. I'd love to smell flowers and garbage. Only on a perfume blog does a sentence like that make perfect sense. . I didn't watch the clip as I was focused on the perfume. I need to sniff some Dorella! Thanks, Barbara, for the draw. It sounded strange to me to have a perfumed nail polish but what the heck, let's do it! I like that she was obsessed with it. I would love to try this perfume too. Makes me deeply regret selling a mini of this fragrance to a perfume bottle collector while on the job behind the counter at the antiques mall where I work. Will certainly be keeping an eye out for another - and for any vintage beauties for that matter. Am so enjoying your blog! Any movie that gets people excited about perfume, especially kickass vintage Dior perfume is worth the sudden loss of a twenty dollar bill at a Cineplex. First of all I loved the film. The women's characters smelled of green chypres to me, they were all the things women on modern perfume publicity aren't, strong and enigmatic. This scene in particular made my mind subconsciously work double time to imagine what the perfume Rosalyn could have in mind. I have only smelled the current Diorella formulation and even this is an exciting scent, the kind of perfume you slip into, not put on. Would love to try it; love the funk. I need to see this movie! Thanks for the opportunity. This scene intrigues me because I picture her alone and this is a comforting, mesmerizing scent. She knows that her husband doesn't love her. Rosalyn enjoys a scent that has meaning to her in her very boring, lonely life. She holds it dear as symbolism as an ideal love. Perfume is ideal love once you find your perfume loves, or huffers. This scene made the movie. Thank you for sharing. Did not see the movie, but have read about this scene at it intrigued me. Would love to try a sample of vintage Diorella. There is scented nail polish out there! I did smell some vintage nail polish from my grandmothers leftover stock from her salon 20 years ago. I can still smell the fragrance in those dried up samples and the old Merle Norman mini lipstick samples. I love them. I'm sure there's lead in both samples. I adored this scene - not only did Jennifer Lawrence steal the whole movie right then and there, but I delighted in her recognition that a scent with something rotten about it can be intoxicating and addictive. I think that the best scents definitely, as both you and the movie say, need a little something nasty - but it takes a particular kind of character to admit it and revel in it. P.S. Don't put metal in the science oven. I loved that scene. I love clean scents usually, but there's something intoxicating about something that is slightly off. I would love to try the original version of this scent. I have not yet seen the movie, but I'm certainly intrigued by it now! I haven't seen the movie yet, but I do like this scene. Jennifer Lawrence displays a natural finesse, confidence and prowess which somewhat distracts from the fact that she's much, much younger than the real person she's portraying. She has the ability to capture the essence of Rosalyn's personality, which is somewhat mimicking the description of the Dior perfume/topcoat: beautiful, but there's still something off-kilter. I love perfume that is a mixture of sweet and sour---like the sickly sweet scent of too many flowers bunched together in a room. Something doesn't necessarily have to be cupcake sweet to be addictive---a little nastiness gives it a timeless edge. I have yet to see the movie. I guess I will have to watch it when it is released on DVD. Would love to finally get a chance to smell this famed perfume! I loved this scene. I love the fact that she is open to how beauty is often laced with something a little bit more.. evil (in smell, in this case). And, I would love to get to smell the original version of this perfume!! Your descriptions of the vintage perfume are so very intriguing that I can't stop fantasizing about comparing the two side by side. Your writing is wonderful, and it's little wonder that someone would be inspired by your insights. I can't wait to read your entries on some oldies I was reminiscing about recently. I've always felt this way about Tom Ford Black Orchid - one of my favorites and yet I can't deny that it smells a bit….overripe. Would love to smell the original Diorella!! my aunt, single southern gothic lady extraordinaire, wore diorella. she lived in the woods that bordered a small town, in a turn of the century farmhouse on a sliver of land that was once part of a pecan plantation. there was more than a touch of grey gardens about her--a kind of tragic, decaying glamour, but also a deep egoism that was at once rebellious, spiteful, and completely unsympathetic. when i was a kid, she was kind, but terrifying and i kept my distance. as an adult, i'd like to smell that scent again. maybe there was a touch of rosalyn in my aunt, a kind of self recognition where you know what you're worth, and what you may be capable of, but you're also aware that you may not achieve it, that there's a rot right behind the blooming. I've been dying to figure out the American Hustle topcoat mystery for months- but there was no good explanation. Thank you for this fantastic article. Now I'm dying to get my hands on Diorella. I definitely found it intriguing; its similarity to your review even moreso! That scene at the table with Rosalyn going on about the smell of her polish caught me unawares and I felt a little embarrassed for her at first. One just doesn't do that sort of intimate and odd revelation with a couple you've just met....unless you're the character Rosalyn! It was so wonderfully girly and with the mayor playing along to be a good sport or because Rosalyn was such a knockout made it even better. However it was inspired, it was a killer scene and I worried I might be the only one who didn't know about the polish smell thing. All old cosmetics, whether nearly flat lipsticks, tiny crumbles of rouge, or a slim, lingering circle of pressed powder in an old compact just send me. They send me. I've got to smell Diorella now. It's the coriander that did it for me. I just can't get enough of the stuff! A Canadian eco-friendly brand, Green Beaver, created a cilantro-mint lip balm based off of their toothpaste of the same flavour, and it's delicious. My boyfriend will often kiss me and then proclaim, "cilantro!" A perfume with hints of the herb would complete the experience. I love this scene because it's rare (outside of the perfume nerd world) to see discussion of the way a complicated scent can both attract & repel you. Good stuff! I read Alison Freer's post over on xoJane and am so intrigued by this scent! I haven't seen "American Hustle" but there's something very human about the intersection of rotten and delicious. I like that there are groups of fragrances that hint at what they're trying to hide. The scene did not intrigue me as much as the article Alison Freer wrote for XOJane. I gotta have it after that! I was obsessed with this scene because JLaw neatly sums up my favorite combination of scent and style: repellant and seductive at the same time. All sweetness needs a little something nasty to offset it, and I'm dying to try this scent! I was/am completely intrigued by this smell, this scent! Granted, I am not an expert, and I can't pick out all of the notes of most things but there is just something elegant about finery mixed in with trash! For the rest of my life I'll be wondering! It's a soul question about scent! I loved that scene in the movie, but I've never actually smelled anything like that before! My dad actually used to wear pure civet oil back in the day. He still has it, and I smelled it, and to me, it smelled absolutely wonderful! I'd love to smell this old incarnation of Diorella! Your description, and I suppose the clip as well, makes me very curious about Diorella. Not so sure about the scented top coat... I generally don't associate nail polish or top coat with any pleasant fragrance. Thank you for this draw, I am in the US and would like to be counted in. That clip is interesting; maybe they stole the dialogue from your post. Could be. Think you can trace the inspiration for the funky note in Diorella back to Jicky. It's a French thing. Please enter me in the draw. This scene sent me on an internet search for the topcoat for days. I would love to try a perfume with the same traits! I wear a few Tom Ford scents and they often incorporate that same tension between seductive and repulsive. Please include me in the drawing -- a vintage sweet rot scent sounds fascinating! I found this scene fascinating as I've always been interested in perfume and how they can smell differently on different people. The whole "American Hustle" exchange reminded me of time around 1990 when I was wearing Poison as my perfume exclusively. One of my friends and classmates was going on and on about how he hated Poison and how it smelled like "fetid garbage." I spoke up and said "that's what I'm wearing now and what I always wear." He absolutely did not believe me as he said he couldn't stand Poison, could smell it immediately and would have noticed if I had been smelling both flowery and rank all these months. He was sniffing me, my hair and my clothes like a bloodhound and roundly declared it was not Poison which smelled completely different but I assured him it was. I always remembered it because how often does your scent get compared to "fetid garbage?" Either he was mistaken about what perfume Poison was, was embarrassed and didn't want to admit he did think I smelled like fetid garbage all the time, or the perfume smelled radically different on me than it had to him out of the bottle or on someone else. The combination of sweet plus the magic word "garbage" really stuck out to me in the American Hustle exchange. I also thought it was interesting that Poison is one of the perfumes listed with the allergens that the U.K. is banning. Or you may need to get over yourself, darling. You both copied Luca Turin and his assorted references. Copied, Tania? Really? (And "darling" is pretty condescending.) I am influenced by Luca's writing, like many people who are into perfume, and I cite him and put quotations around his writing when I use his exact words. I don't copy him. And the references I listed above that I found echoed in the movie are from my writing, not Luca's. Need I point all the similarities between our text and yours? All right then. The coriander is in the Vitenamese salad reference in Diorella's review all right, the "rotten" is in the "gone bad" bit you quote of Luca's, the flowers and fruit are self-evident, "garbage" has been used by Luca while discussing Le Parfum de Therese (another perfume by Roudnitska same as Diorella) while the concept that "great perfumes contain something nasty" is referenced in Emperor of Scent regarding Luca's argument about pourriture noble. Unless you want to counter-argue that we're also copying you! Tania, there are multiple issues here. My blog post writing is always a pastiche of my impressions and other writers, and sometimes comments from perfume forums. But I always cite other people's writing. What I encountered in "American Hustle" was plagiarism from my blog. Some of that included references to others ideas, but it doesn't take away from the fact that (I believe) that dialogue came from my blog. I'm not saying every idea and word they copied sprung ex-nihilo from my brain. But I do think they looked at that post and copied it, in sequence. As for your belief that every experience I write about in the Diorella post that references fruit, flowers, or things going bad is a copy of Luca's, well, that's going too far. I had my own encounter with the perfume that led to my own references and choice of language — Leonard Cohen's Suzanne, hence the "garbage and flowers" and the fruitiness of the perfume smelled (as I mentioned) like jack fruit or Durian, hence "sweet/rotten undertones." As for coriander, I don't remember reading that in your Diorella writing, but it may be there and maybe I smelled it, too. It's one of my favorite notes in vintage perfume. As for the "great perfumes having something nasty in them," mention I don't doubt Luca mentioned that somewhere, but I paraphrased it from an article I read, and hyperlinked the article in my post. This was a blog post from a few months into my vintage perfume foray. I don't pretend it's some grand masterpiece, but did I think I needed to call out how familiar it sounded in "American Hustle"? Yes, I did! To the best of my abilities, I give credit where credit is due. And I would say that I have continued in my blog posts and book, to cite and laud both you and Luca. I even went to the Scent Bar to meet you! It was kind of shocking then, to get such disdainful comment from you. But I guess I know how you feel now.